A highlight in any car enthusiast's diary is the annual 'Circuit des Remparts' weekend; this superb event sees classic cars hurtling around the ancient, twisting roads of this pretty hill-top town. The track hasn't changed since that first race and it is one of the very few motor races to take place within the walls of a town. The course itself is very demanding, twisting around the town ramparts and containing two right-angle bends and three hairpins. There is a wonderful eclectic collection of historic cars and, as with many historic motorsport events, participants and spectators do dress accordingly. The first "Circuit des Remparts" race was held in 1939 and further races from that date were spasmodic until 1983 when the race was revived. It has taken place each year since, bar 1989, and now holds the distinction of being the last race of its kind with only Monaco and Pau offering high speed, French city street racing. The circuit is 1.279 kilometres in length with three 90 degree hairpin bends and two fast straights where drivers reach speeds of up to 120mph braking down to 20mph at the hairpins. The weekend starts on the Friday with the 'Concours d'Elegance' (Elegance Parade) when owners get the chance to show off their gleaming cars prizes are awarded for the best presented car and driver. The cars are parked throughout the town centre so it is a great opportunity to get close to them and talk to the owners before the more pressured race day. This event is free to enter and is great fun to participate in. 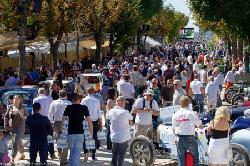 Saturday is the day of the Charente International Rally, a leisurely affair with some 300 cars taking part. The route is released few days beforehand and includes a generous lunch stop at one of the sights of the area. The cars return to Angouleme late afternoon and there are great picnic stops along the way if you want to watch them pass. For many visitors to the Circuit des Remparts, this is the highlight of the weekend; it is great fun and is highly recommended. Sunday of course is race day and the focus shifts to the famous Circuit des Remparts, the old street circuit around the walled town of Angouleme. Practice around the circuit begins at 08:00 and after a break for lunch the competitions start from 14:00. Each year racing includes a variety of classes and vehicles including historic F1 & GT sports cars. Each year a different car exhibition takes place in the town hall gardens. This event is free to enter, by invitation only. If you have a vehicle pre-1976 you can enter any of the following events across the Circuit des Remparts weekend. Saturday Rally Price: £339 includes car, driver + passenger, car plate, breakfast, morning & afternoon breaks, gastronomic lunch and welcome pack. Situated in the heart of Charente vineyards, the 3 star Hotel L'Essille is located in the very small village of Bassac approximately just 16 miles west of Angouleme. 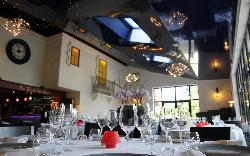 The property features an excellent restaurant, spa, garden with a terrace and a tennis court. Air-conditioned guest rooms are individually decorated and are equipped with a television and telephone. All rooms have a private bathroom. Free Wi-Fi internet access is available throughout the hotel. Rooms also offer views of the surrounding area. A buffet breakfast is served every morning. Packed lunches are also available. Free private parking on site. The Hotel L'Essille restaurant offers lunch and dinner and well-selected wines in a open, welcoming dining room and is featured in the Michelin Guide for restaurants. If you're looking for great food, a calming environment and a classic drive through the Cognac vineyards to Angouleme, then look no further. Our packages offer a choice of self drive options using P&O Ferries or Eurotunnel. All prices do not include entrance or grandstand tickets. Free for children under 14 years. £15 supplement for ticket only bookings.